In 1984, 35 years after George Orwell’s grim novel was published, The Star asked Isaac Asimov to write about what he thought things might be like in 2019. So far there has been no nuclear war so we have survived that threat, for now. But going into 2019 the risk is still there. 1984 was early in the adoption of computers in homes. I was selling them then, and it was a small market, but it gradually grew from there. Various types of robots are very common in some industries, like manufacturing, but apart from toys they have been slow to take on in homes. Is there anything much other than robot vacuum cleaners available? They don’t seen to have caught on much. I think you can get robot grass mowers, but they have hardly taken over our gardens. Automated functions in cars have become common, but they still only assist driving. Robot cars still seem to be unproven technology and could be years away. The growing complexity of society is a real issue, or could be if humans become too dependant on computerised devices. It is changing things, but not really a large amount. I have worked in computing jobs over the last 35 years. I still go to an office and help people use computers. There have been some changes – site visits are less necessary, a lot can be done via remote connections, and we can and do support customers around the world – but I wouldn’t say that my work has changed dramatically over that time. Certainly clerical and manufacturing jobs have been lost, but there are still many jobs, more jobs, in other industries like hospitality and tourism. …a vast change in the nature of education must take place, and entire populations must be made “computer-literate” and must be taught to deal with a “high-tech” world. Many more people are “computer-literate” as users of devices, but our education systems aren’t a lot different to what they were like in 1984. I don’t think that the changes to education have really happened much yet, and the ‘transition’ is far from over, in fact it may never be over. We now live in a relatively rapidly changing world. Food production for an expanding population has been an opportunity for New Zealand, an agricultural country. But there are problems here, for example with housing being unable to keep up with a growing population. A transition to low birth rates in developed countries seemed to largely happen without encouragement being needed. The easy availability and social acceptance of contraceptives and abortions seems to have worked this one out. Improving living standards in high birth rate countries seems to be the best approach to deal with the population explosion. It is more likely that in the future people will need to be encouraged to have babies to prevent the population declining too much. There are plenty of wills to achieve this now, driven by the threat of climate change, but limited ways still. Asimov did not mention climate in his look into the future. That is the driver for radical change, but the technological solutions have been slow to materialise. There may have been increased talk between nations on some things, but action is lacking. And so is cooperation – the country with biggest economy in the world, the US, has chosen not to cooperate for now. With the increased self interest of the US under Donald Trump, and the UK trying to exit from the European Union, the opposite seems to be happening. This may be happening to an extent, but I’m not sure about how much- I see kids more interested in using devices to play games rather than to educate, but I see some learning as well. I have a seven year old granddaughter with a wide knowledge of insects and fish in particular. Like blogging? Technology makes it possible, but I don’t know that it makes much difference to the world of politics. Add my third phrase: space utilization. We are a long way from this happening. And humanity, not its structures only. will eventually be in space. By 2019, the first space settlement should be on the drawing boards; and may perhaps be under actual construction. This looks to be a long way from happening. There has been significant changes with computing and technology, but institutional education and ‘space utilisation’ haven’t really changed advanced a lot in the last 35 years. But it’s not 2019 yet. The revolution may still happen, but time is running out. Not a bad forecast by Asimov. Probably underestimated human and political inertia and overestimated technological investment compared with investment in comfort and entertainment. Education at lest higher education is going on line. The girl has to transfer from a lecturing students in front of her to a 100% on line delivery this year. She will be grumpy and over worked as it is a lot of work to set up the on line content as well as teach. We just take it for granted you dont need to get up to change the channel by turning the dial. You can use an app on the phone to remotely turn on your lights,set the climate control, arm your alarms, record your favorite shows and many other tasks. Not the classical metal man but still “robotic” . humanity, not its structures only. will eventually be in space. By 2019, the first space settlement should be on the drawing boards; and may perhaps be under actual construction. Musk time as slightly longer than human time. I remember when remote controls were an optional extra for televisions. We didn’t bother because there were so few free channels that it didn’t seem worth it. I remember when computers were a luxury – and expensive !!! Our first one was the Dell sold by The Warehouse, a cumbersome thing but we loved it. Robot lawnmowers are expensive, but I should think that they’d be worth it. If you pay someone $40 to mow every 3 weeks, that’s the cheapest robomoa paid for, or all but. Even the dearest ones wouldn’t take long to pay for itself…I was amazed that one cost $873; I looked just now. 33,000 empty houses in Auckland alone roughly equals the amount of stock needed. No one foresaw the effects of Q.E or the escalation in the number of ‘millionaires’ in China and how western housing markets were impacted by land as a store of wealth for money laundering and became the only asset to be really trusted. Self-indulgent excessively-powered bureaucracy not bothering to keep up with the need for housing and infrastructure. not the major cause by far.Added expense.. yes. Actually it is more the National goverment and its use of immigration to expand the economy without taking into account the unintended consequence. 70,000 extra New Zealanders a year is a lot of stress on infrastructure that should have been planed for . Especially as they come in as adults already using roading, housing etc not as baby’s with a twenty year gap between birth and impact. “I think you can get robot grass mowers, but they have hardly taken over our gardens”. Your thought is correct pg although best to keep them out of the graden. I’ve had mine for a while now and in that time he’s turned the lower 45 into a bowling green. Packed with electronics including ultrasonic sensors, GPS and even a SIm card for two way communication. Very nice. 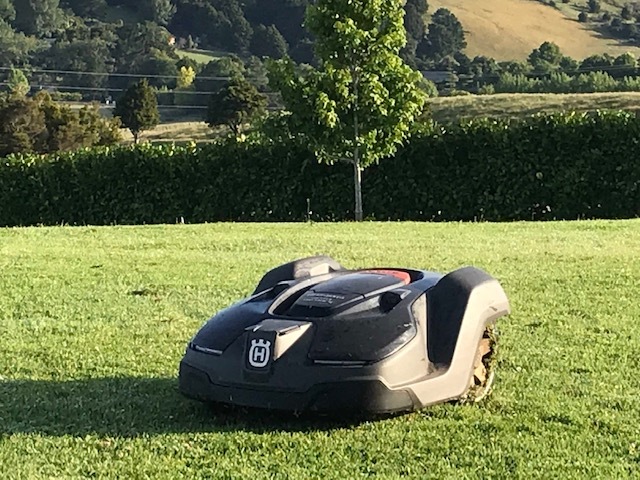 It’s also a good example of just how hard true ‘robots’ really are, mowing a lawn would appear to be a simple task, yet requires far more computing than most would ever imagine. Just wait until you have two of them and they start arguing about God…. Cabbage, my 5th form Latin teacher, made similar remarks on my mid-year school report. Same here, Parti, to both things. I was looking at rechargeable ones and as robots were there, I had a squiz. The price put me off, especially as the moa I have is fairly new and going well, but what a luxury they must be. They’d probably pay for themselves quite soon, though. What brand is your liitle bloke, and how big is the section ? That is an American site, but those are the ones that are $800+ here, I think. A few robotic cruise missiles penetrated some of Sadam Hussein’s homes as I recall. I haven’t read Asimov but from here it seems the changes he wrote of were about peripheral things not about what they and other factors would mean for the shape of the world through what they do to people. Or for them. In some countries lives are determined by conflicts from hundreds and thousands of years ago. It seems in little places with the type of society we have it’s about the the type of people the peripherals have produced and there is focus on the ‘nature of the beasts’ – Baby Boomers, Gen X, Millenials – and the consequences of the characteristics of those beasts. Last para is a head-scratcher. Asimov did not predict pro rugby, Liverpool going 30 years with out the title. He did not predict American idol, Bruce Jenner going trans gender Lady gaga, a Black President , Game of thrones, the Christchurch earthquake Kim Dot Com, the Prime minature. No the guy is a frord. I bet he did. He just didn’t make a big thing out of it. 29 years thank you not 30…. in Jurgen I trust! Until City win at the Emptyhad then you will get the jitters. Damn. Just had to give G two upticks – almost three. Clifford Simak got the closest I believe, in his masterpiece, City. Given he wrote it in the early 50’s, rather well done. There already is that opportunity. There’s no reason why school attendance and individualised learning can’t happen, as it already does in many schools, and kids can access the internet as easily as the rest of us to learn what else they want to when they want to. Unfortunately a lot of them just want to learn how to play games. Might be good US killer drone pilots but possibly not much good at anything else. Who do you see supervising this bubble up from within learning for the kids? And how do you see Employers working out whether they’re literate and numerate enuf for jobs they applly for? Have you got some kind of concept in mind for managing and testing learning to stop kids just playing at it and learning nothing that will earn them a living, or are you just daydreaming? The most listened to TED talk of all time supports PZ’s point in a compelling and entertaining way. Instead of nurturing creativity, industrial revolution era schools have stifled it. I think this may challenge your views and prejudices G. Well worth a listen! Yeah I’ll watch it (I’ve started) but meantime would you answer the question I posed. Also could you explain how your school education made you the total failure you are today & incapable of progressing your own learning further in addition to it? Or if this is not the case, why it isn’t the case? Yes I’ve seen it now. I mean, he makes some good points, but like PZ he doesn’t deal with so how a country should manage education in the basics of literacy and numeracy and say the general sciences that most of us need to understand outside of a school environment – leave it up to parents? Leave it up to the kids. If the education system worked the way he posits I would have been doing music, because playing by ear comes naturally, and trying to make a living out of that. But back then, given how hard it is to make a living, how much travelling is involved, and how very, very few succeed in making a comfortable living in that area of work – and how much resilience (something I lacked) is required – if I look at that realistically, it wouldn’t have worked out, in all likelihood. It was better to have that as a hobby and play in some bands to work out the dream wasn’t all it was cracked up to be. Education at school enabled me to get other work that put a roof over our heads and acquire the usuals for the kind of lifestyle we aspired to. Some of what he said is basically just comedy, and he focuses on exceptional people, then extrapolates that out to mean that everybody is is exceptionally good in some area. Imo, that’s just not so. “All children are naturally creative” is something of a warm fuzzy catch cry that blissfully glosses over a multitude of sins & disasters creative children get up to that often don’t work out so well, so I tend to be a bit leery around buying in to that one. It will be interesting to see how education does develop over the next few years because elements of it seem pretty chaotic these days. And dance. I hate dance. I think there are limited opportunities in these fields because they don’t interest a lot of people. There are limited opportunities in dance … Perhaps because we’re acculturated to NOT be interested in it …? No, it’s just never interested me. Or any of me mates. Same with drama. Hated it. Bored me shitless. Drawing and art I was pretty good at. Going thru my report cards the other day I was surprised to see a couple of firsts in art. Both my brothers were good at it too, but I’m the only musical one. I was especially keen on cartooning & used to do them for our work in-house mag & colleagues’ farewell cards at one stage. But it wasn’t something there was a lot of call for paid work wise so I eventually lost interest. A good summary G. I take your point that some folks are destined to be eternal critics but seem unable to muster up a solution. I think the main message here is instead of throwing the young into the academic grinder, give them space to explore and develop their natural talents wherever this takes them. Has to be better than a machine churning out grads with increasingly worthless degrees. Some of the most gifted people couldn’t read – Einstein, da Vinci, Beethoven and ask yourself what stimulated innately productive dropouts such as Gates, Jobs, Zuckerberg and Ellison? Leave Zuckerberg out. His name is crap these days. A cunning, bullshitting rotter of the first order. Yes, good point. But do we churn out grads with increasingly worthless degrees to the same extent that the US does? And of those degrees that are worthless, don’t they tend to be ones that are worthless because they’re things that people developing their natural talents have created for themselves in the world of genderisational studies & hip hop studies (cos they’re useless at DOING hip hop)? What you’re suggesting has big implications for how schools are structured and how much resourcing and what kind of resourcing needs to go into education. Maybe the Labour Werkinggruppe will produce some answers – but given their being so beholden to the teacher unions major change looks unlikely to happen any time soon. Gezza, you have major change stopped by teacher unions. Have you considered that major change is unlikely to happen any time soon because of the fear of letting educationists who think like Ken Robinson do what they think should happen? Who is going to trust teachers? The regime operating in schools today is more likely to be unimaginative technicians trained to think and operate with limitations. That impacts on not just how they operate, but inhibit their even understanding Robinson let alone envision what it means for practice. What he’s on about would be beyond most of them. There was a time where the sort of thinking needed to develop approaches he talks about would have been welcomed, an environment which would have saluted and accepted what he sees as important. That sort of system, back when, was the basis of acclaim as ‘world class schooling’ and had people around the world using New Zealand as an example of excellence. Those days are gone. Ironic that it seems some who killed the golden goose are now complaining that all that’s left is a piece of dried old KFC. @Con..the first 3 undeniable,irrepressible ..talent..the other 4 ..luck. My conservative and regimented school produced more than its share of rebels and risk takers. A return to vicious, socially-stratified, brutal corporal punishment schooling will lead to the advent of more-and-more innovators and entreprenuerial risk-takers … the most desirable members of neoliberal society …? War is often recognised as producing innovation albeit at huge cost. Extrapolation to absurdity is just that. I wonder though if TC was right. You never seem able to articulate how you see your proposed alternative system working. Just the eternal critic. Or alternatively, ” … earning a living that will learn them nothing”? If you can’t learn anything while earning a living you’re retarded. Where did Parti go to school ? Borstal ? I don’t remember any school remotely resembling his ideas. No, I am thinking that how our current crop of teachers will manage to run an individualised teaching environment structured to the individual talents of every student will be stymied by unions demanding higher pay and more teachers and that will dominate the teachers’ educational landscape, not change in the way they teach, and what they teach. 1. what kind of teachers do you think will be needed? 2. what kind of certification if any will be needed to ensure they don’t get people who eg can’t do more than paint crude water-colours to teach art? 3. what core subjects do you think all schools should cover – eg English, Maori, Maths – to what level, NZ history … ? And remember some kids will always want to be rocket scientists but will never understand maths; others will want to be ballerinas but will have two left feet. Kids wants and dreams and abilities often don’t match. There’s always been that time. It’s always been talked about. Why hasn’t it happened to any great degree. If you can answer my questions 1 to 4 above I might be able to get some idea. I think the problem of people coming out of institutions skilled in stuff that pleases them but nobody’s really interested in is a problem for them and whoever has paid for it. When was this? Because one thing I remember New Zealand being used as an example of once was providing a good solid free education to all children – and their being able to build on that if they wanted. We did art. We did drama. We did cadets (fkn excellent, got to strip and fire bren guns, not too many schoolkids get to fire machine guns as part of their curriculum these days).j There were all those options for people to pursue at higher education level but the basis of education was certainly to skill you for employment, whether in trades, professions, retail, running your own businesses. In other words, to be able to earn a living by providing services that someone wanted and contribute to society in that way. There’s nothing wrong with that. That’s how most people have got by. Because they don’t want to take the risk of following dreams that won’t earn them a living, because not enuf people will pay them to do that. Well, what do you mean exactly? Do you want taxpayers to subsidise artists because they can’t pay their way? For example. I mean I like that idea but does it mean they should also pay every kid who wants to start a garage band as well as the NZSO? Every person who wants to flog off oil paintings? Can you just tease that out a bit for me. Mrs Al’s class provides a possible solution. They made a deal that if they finished their year’s normal curriculum in six months they could organise their own studies for the rest of the year. Did all kinds of interesting things. Subversive … I LIKE IT!!! Yep. Mind you, you don’t want to stand between Mrs Al and something she wants. A mere teacher would stand little chance of resisting. It’s a good plan. How did they go with the normal curriculum? Did performance rise in that area too? Does she remember Al? I gather they all did very well. A lot of Jews in the class. She was mostly interested in telling me the trips she organised and things they made.